Inspire Bingle: Do you pray in the bad times and the good? I guess it’s just a part of who we are as human beings to pray the most when something’s not going right in life. 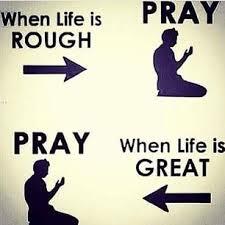 We pray when we’re in trouble, or worried about our health or a loved one’s health, or scared, don’t we? “No sir, I don’t,” said Gary. “Why not?” the dad asked. I’m like Gary sometimes, aren’t you? I only pray when I’m scared or in trouble or worried. But you know, there are other times to pray like when something good happens to you and you want to thank God for blessing you. Or, when you or a loved one recovers from an illness and you’re grateful.